Ok guys, hold onto your hats because this one came out a little unbidden. In trying to talk about our big plans for what we’re doing next (soon! ), I couldn’t help but go into some of the background thinking behind these plans, and it turned into something of a manifesto. Now, I may be a philosophizer and a wax eloquenter, but I’m not usually one to write a manifesto. A manifesto will nearly always rub at least someone the wrong way, and I have in general lived my life bending over backwards to try never to rub anyone the wrong way, to please everyone, to be safe. I brought these scones to a goodbye brunch at my office a few days ago. We were celebrating and sending off three of our colleagues who are on to new things. All three of them did great work and will truly be missed. Though I wasn’t included in the goodbyes, it felt like the time for me to say goodbye to everyone as well. We’re leaving. We’re moving! I’m not done with my dissertation yet. Ha. Quite the opposite. What was once a wade through data up to my knees has become thrashing in data up over my head. I’m doing a little egg beater kicking, a little elementary backstroke, working on finding the best way for me to swim through it. But, it won’t be happening here. Joel and I have decided we’re moving to Minnesota. In less than a month. Yikes! We’ve been thinking and talking about it for a while now, and finally things conspired to remind us that these are our lives, and we need to live them in a way that is honest and real for us. Now, I don’t mean anything against Boston at all. It’s a really great city. A great place. But, it’s not our place. And, in staying here, no matter how hard we try not to, neither of us can escape our programmed slide into the speedy rails of achievement orientation. Both of us have little devils on our shoulders telling us that in order to be worthwhile, in order to do anything that’s worthwhile, we have to be impressive. I’ve tried to tell off this devil for years and years, tried to argue with it and assert that I’d rather do good work and be me than be great. But it argues back that in order to do good work I have to be renowned in some way or that I can’t make a contribution if I’m not the best. And being in an achievement oriented city feeds it and gives it too much strength for me to fight back adequately. So, we’re consciously choosing to opt out. We want to focus on doing good, meaningful work knowing that perhaps we will never be known for it, but that it really is important nonetheless. For us, part of this means working on concrete things, not just in our heads. As, I said a while back, we want to make things. So, we’re working to make that come true. We’re going forward with the distillery plan! Perhaps it’s insane, and we may fail, but we’re going for it. Joel will work on getting the distillery started while I finish my dissertation. At the same time, I’m going to be trying to connect with any and all local, real food action happening in the area we’re moving to. Then (um, well, if we can navigate zoning laws effectively) we want to bring it all together into a wild, innovative, place-based, community oriented distillery-cafe-experimental-food-and-culture-center that will also support and add to the local, sustainable agriculture in the area. Through the platform of the distillery, and in connection with other organizations, we want to work both to preserve the local watershed and toward making the community energy and food sustainable. We want to model an engaged way of doing business that sees people and the planet as integral to the bottom line because I truly believe that the idea of the profit motive and that we can have such a thing as unlimited growth are going to turn out to have been the great myths of our time. Harmful myths at that. Our plan also hooks into our concerns about climate change. It’s something that’s worried me for as long as I can remember, but in a vague way that was assuaged by biking to work and eating local food. But lately the concern has become palpable. Ever since my hometown was drowned by floods even as farmers nearby lost their entire crops to heat, and the area around where Joel grew up was hit with deadly storms, it’s become something I think about every day. And, it’s frustrating that almost nobody is talking about these things in terms of climate change. 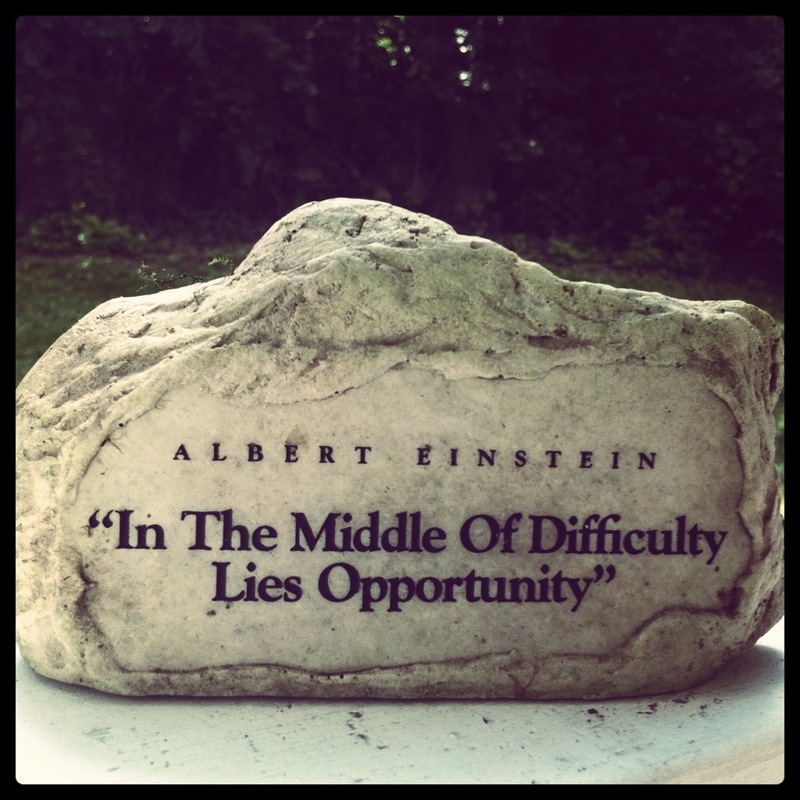 Joel overturned a rock in our yard, and it said this on the other side. Not a bad find! Honestly, I hesitate to bring it up as well because it feels so political, and I don’t want this to be a politicized space. But, as Joel pointed out, the weather and the climate actually aren’t political. They are what they are, and what they are is becoming more and more extreme. I don’t mean to be a Debbie Downer or Suzy Doomsday (she’s Debbie’s older sister, in case you were wondering), but this is the future we’re talking about, and we’re all in it together. But, it’s hard to truly consider the truth of the future we’re headed toward without distracting oneself with either denial or total despair. I’ve done plenty of both. But, when I finally stopped taking it personally, stopped wringing my hands or clenching them in rage, I decided to sit down, take an honest look at what my greatest strengths and passions are and how I could use them productively toward change (and Joel did the same), and this plan is basically what we came up with. It may wind up being a drop in the bucket, but with the memory of a flood still fresh in my mind, I say, don’t underestimate the power of a drop when you add a bunch together. I’m definitely not an expert on climate change, but I’ve been working in the field of obesity for long enough to know a systems problem when I see one! And the thing with changing a system is that it requires cranking on leverage points in many different places on many different levels. Sweeping changes need to be made on the policy level, the community level, the organizational level, the individual level. No one is exempt. Massive policy change and global coordination needs to happen, but individuals also need to step up and say, yes, we’re willing to have these policies and shift to new ways of life, and communities can coordinate to become sustainable as neighbors work together and offer helping hands. I saw this note on Kate’s blog a bit back and it resonated. I’m not saying everyone should take the approach we’re taking. Goodness no. We each have our own path. But, I do think everyone should care, and care enough to fully consider what this means to them and then creatively problem solve how they can make change in their own lives. Now I may seem delusional, but I really think that we have the ability to tap into boundless creativity and innovation, no matter who we are, if we let go of our narrow definitions of ourselves and how we work. There is so much potential for true hope if we start by admitting that we can’t change what is, but we all the have the capacity to change some of what will be. For ourselves, we’re upending our lives and moving to try to live, to co-opt Tamar Adler’s phrase, with economy and grace. I’m scared, and excited. Time will tell how it goes. Our physical space will be changing, and so will some of our work, but as long as I have stories to tell or ideas for how to eat real food, I’ll still be in this space (if you’ll still have me with all my ramblings!) because I truly believe that real food, and cooking, and sharing meals matters. Who’d have thought it, but this actually brings me back around to talking about my dissertation (it all connects!). Though our main study is about working with new immigrants to connect them with the tools and help them come up with strategies to access and eat healthy food (speaking of creative problem solving, if you get them in discussion and truly listen, all the women we’re working with have just brilliant ideas), one of the principle things I’m learning about personally is what it takes for diverse people to work together and create solutions to difficult problems. What it takes is trust, transparency, acknowledging your own desires and agenda and then being able to set them aside for a greater goal if need be, having a broader understanding of your role, really listening, telling your stories and being completely open to others. And, it’s remarkable, truly remarkable, how much of this can sometimes be aided by sharing meals and meeting at the table. 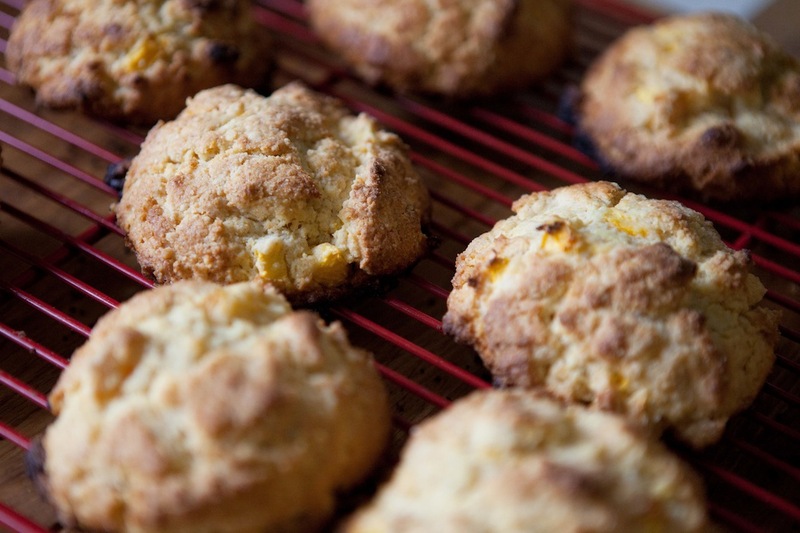 Cornmeal Peach Scones (makes about 14) These are inspired by the cornmeal cherry scones from the Cheese Board in Berkeley, via Sweet Amandine (a new favorite read), and adapted to use what I had on hand. They turned out marvelously. Preheat your oven to 375F. 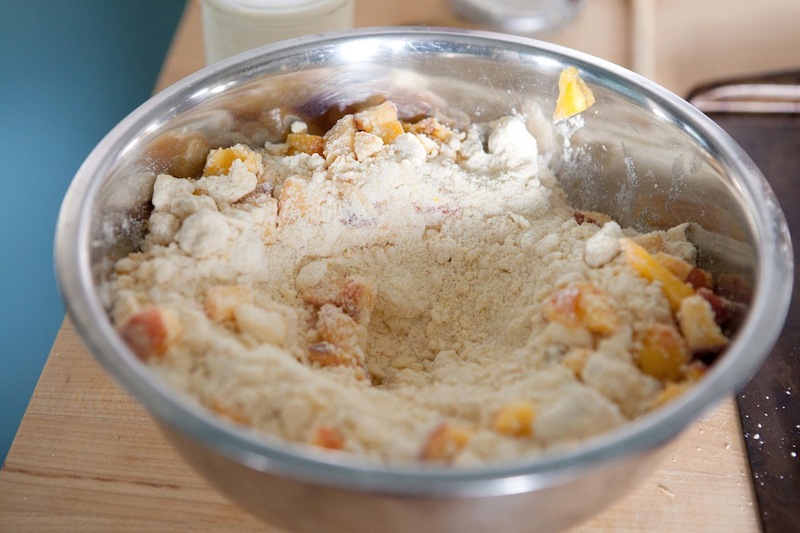 In a large bowl whisk together the flour, salt, baking soda and powder, sugar, and cornmeal. Working quickly, rub the cold pieces of butter into the flour mixture with your fingers until it has a sandy texture with butter chunks about the size of peas. Stir in the peach pieces. Make a well in the center of the dry ingredients. Pour in the cream and buttermilk (you could also use all cream or all buttermilk, but I happened to have a little leftover of each and really loved the flavor and texture each contributed), and stir up the batter until all of the ingredients just come together. 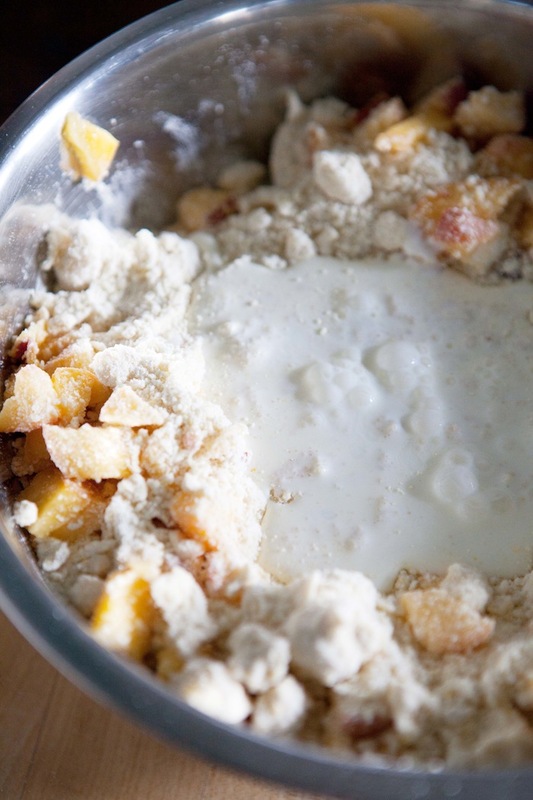 There may be some flour left at the bottom of the bowl that you can’t get mixed in. If this is the case, push the batter to the side and add just a little extra splash of buttermilk/cream to the flour to moisten it, then press it up into the rest of the batter. Drop the batter in large spoonfuls (approximately 1/4 cup each) onto a baking sheet. Bake in the middle of the oven, rotating the pan halfway through to ensure even browning, until golden and crisped on the edges, about 20-25 minutes. Remove from the oven and transfer to a cooling rack to cool. Share with friends, or neighbors, or new connections. Welcome home, Emily & Joel! You have convinced me the two of you will do great things. I thoroughly enjoyed reading through this. I just stumbled upon your blog through the “baking” tag but I’m glad that I found it. I completely agree with everything that you say here. Environmental issues are always considered “political issues” but the problem with that is that we see that as a way to ignore them (because who really likes to get in on politics?!). You’re right though. It’s not a political issue. It’s a very real issue that has major implications. I admire your willingness to beat up the little devil on your shoulder and follow your calling to a different part of the country for a different purpose. The words you have written are very inspiring! 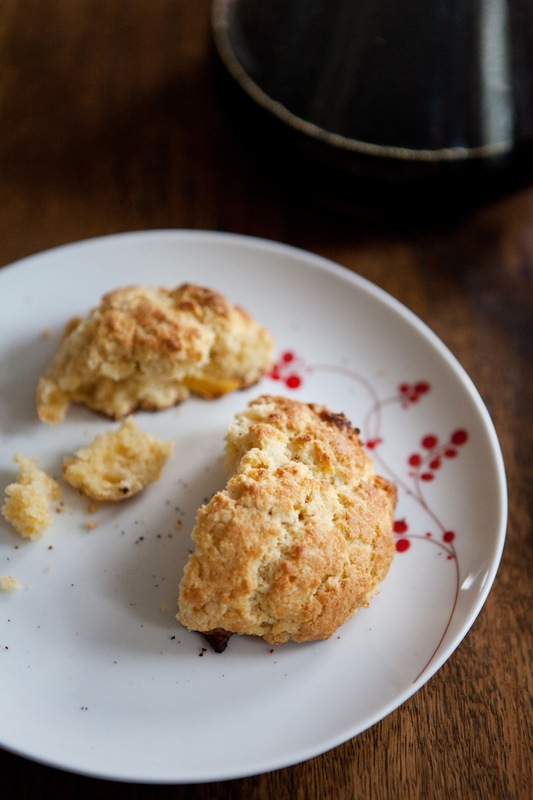 Oh, and the scones look pretty delicious as well! Yes! And thank you! And glad you think the scones look good too. Thank you so much for your kind words of support Heather. I grew up in Minnesota, so I’m excited to be homeward bound. Joel is from Eastern Washington, but Minnesota has adopted him already! I will definitely be blogging along the journey, and I’m looking forward to sharing. Great decision, I’ve been considering similar things, but mainly, and above all else, this recipe looks friggin’ delicious. Anywho, I’m originally from Minnesota and would love to give you some local info. if I can! Where in MN are you moving? I’m from Woodbury, a suburb just east of the Twin Cities, so if you’re anywhere in that area I could be of help! Hi Jess! Thanks for your nice wishes! I think it took the two of us deciding together to give us each the individual gumption. It was a good process. We’re heading up to the Duluth area, which is where I grew up, but it’s been a while, and we definitely want to make connections in the Twin Cities area too, so I’d love to hear any thoughts if you have them! That sounds like an impressive plan! I’m battling with trying to write up a PhD dissertation myself, fun ain’t it? I hope your grand plans work out! Yay, Em! Congrats on your plans. Go for it! Finally, a home for Em’s Buns! Best baked good of them all! 🙂 Thanks for sharing the link. *Loved* it! This is exciting news! It sounds like you and Joel have a plan and a passion and I’m delighted you are going forth. I look forward to reading about your journey. Best wishes to you! Thanks Hannah! We’ll be keeping everyone posted! Good fortune with your new life and venture – may it be all and more than you hope. Thank you so much Elle. We have high hopes – but we are also trying to be intentional about remembering that even if it doesn’t work out, we’ll be learning important things! Wow, as my dad used to say, you said a mouthful! Good luck and best wishes – and the scones look spectacular. i am so excited for you. and to be honest envious as i am have been struggling down a new path for the last couple of months and have not been able to find my way yet. I wish you were moving to my area so i could get to know you both as we seem to have a lot in common in terms of how we feel about the current state of the enviroment, food, the need to change and how possibly start to make that change. However, you are not. So all i can do is say good luck and offer encouragement – go for emily and joel. though there is perhaps something more concrete i could offer – and i seriously mean this – if you are drowning in data and would like some help? i do data analysis for a living currently and would be glad to help you w/ your analysis. it’s small but it might be a little way i could offer support in the huge and worthwile endeavor you are untaking. just let me know if you do. This is a marvelous post. Many congratulations and lots of good luck to you both! If you don’t mind answering, what part of Minnesota are you moving to? It is such a great place for what you want to do–I really hope you will be near the cities! Thank you so much. We’re moving to Duluth! But, that’s not that far off from The Cities! Which I think is great because there so much cool stuff going on there right now that I’d love to be learning from. Congratulations! I found your blog through my cousins, Liz and Margaret, and have been inspired by your cooking and photography. I hope your move home is not too traumatic, and I look forward to visiting the distillery! Thank you very much! I hope you’re right! I think I love you…..both!!!! Wowzers. I’ve only commented here once before (on a post about eating in Italy? ), but this post is prompting me to speak up again. YES YES YES YES. I can SO empathize with your instincts towards real food, sustainable living, and changing your life… as well as having to beat down the devil on your shoulder that tells you you’re worth nothing unless you achieve “greatness”… whatever that means, in all of its vagueness. Go for it! I hope that more and more people begin to think and live this way, we can jointly tip the tide. We’ll all be eagerly anticipating your wonderful stories from Minnesota! YAY!!! You are coming home!! Can’t wait for you and Joel to grace our/your city again! You two ARE awesome and unique and fun and lovable and are going to make great waves near Lake Superior. Will love being a part of your lives again. Congrats! 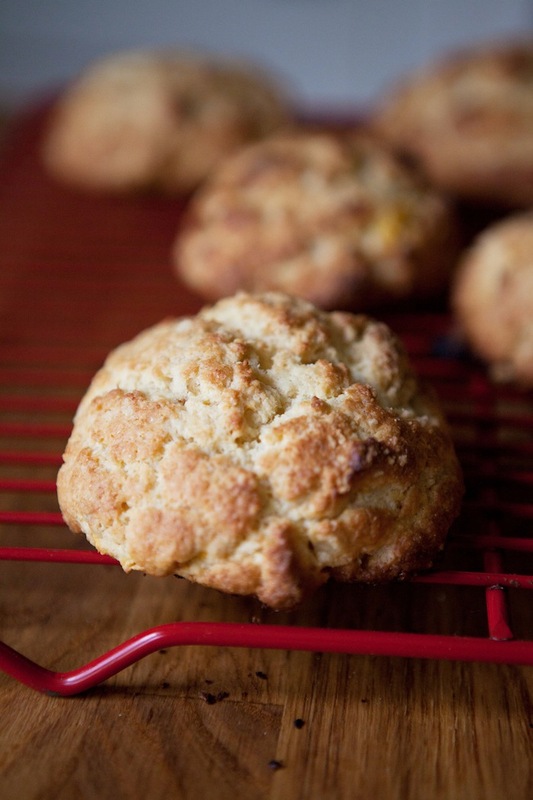 AND…can’t wait to make the scones! Yum. Yippee! I’m so glad you are coming back home again. Woohoo Emily! A) You are going to LOVE Minnesota, especially with your Norwegian roots. B) Yay hand-made sustainable small business ventures! And last but not least, C) If the apocalypse ever comes and you are still making booze, you are going to be one wealthy lady. Congratulations! P.S. The place where we all live (aka “the environment”) is never political. It’s just that some people who like to abuse it for profit would like to keep doing so unchecked, and they don’t like it when regular people try to tell them not to, so they spend oodles of money on politicians who they think will help them keep making giant profits, regardless of other, non-monetary, but not less significant costs. Don’t let Midwestern Guilt keep you from talking about sustainability and climate change! Emily, I don’t know what made me think about you but within 5 seconds of the thought I was typing “Five and Spice” into my google search bar. Maybe it was because I was earlier today telling the story of your car getting towed in Cambridge the night we were supposed to leave to go camping and how we accidentally left all of the food items we meant to pack in the refrigerator. I have to admit that I come here once in a while in part due to my admiration for this site and and in part due to my desire to stay connected to what is going on in your life! I was so happy to read this manifesto, it reminded me not only of how awesome you are but that there are lots of good people on the planet. I wish you and Joel best of luck in your home state and you know that if I’m ever driving through I’ll be looking you up for some fantastic and beautiful food and drinks. You are really one of the classiest people I’ve known! Lisa! It’s so great to hear from you! 🙂 Man, that camping trip was something else. Thanks so much for cheering us on with our new plans. I hope you are doing well yourself! All the best to you both! Your “manifesto” resonated strongly with me. I find myself in constant debates with friends and coworkers about sustainability and supporting local farmers/businesses. Some have come to understand what I had been trying to share with them (I guess I’m not that convincing) and some still need more prodding before they will give a damn. Because of that, it’s a great feeling to know that there are like-minded people out there who care just as much as (or more than) I do about global warming/our broken policies/the importance of community/engaging people in conversations about these issues. That’s hope! I admire your decision to leave the rat race. It’s a hard thing to do, and I still struggle with it living in California where it seems like the measure of success for a young adult is how many startups you’ve worked for and how many electronic gadgets you own and upgrade every two years. Thanks for sharing the thoughts and reasons behind your decision. Good luck to you both and I look forward to hearing about your life in Minnesota! Thank you! You keep up your good work too!!! 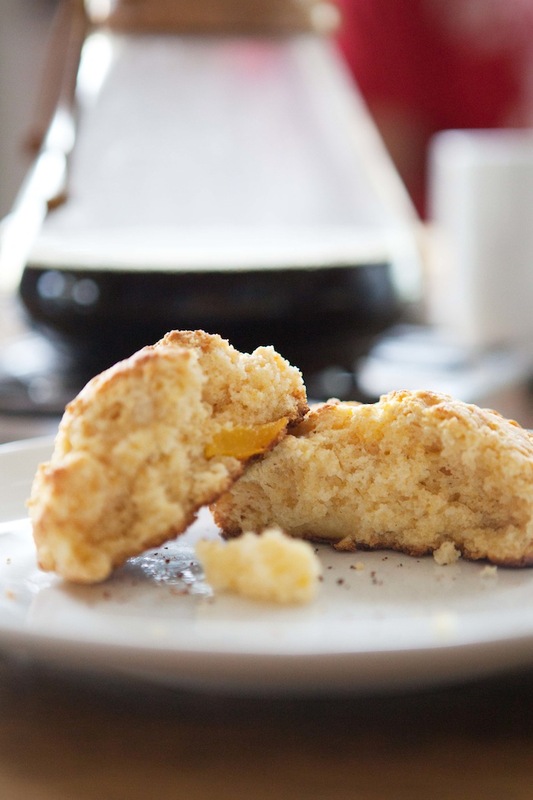 You are currently reading Cornmeal peach scones and something of a manifesto at Five And Spice.